General Francois Fournier-Sarlovese was probably the most daring, unruly, and unpredictable senior officer ever to serve Napoleon. Discipline appeared to be an anathema to him, and rules and indeed orders, were to be flouted or ignored, should he consider them unnecessary or troublesome. He grew into a master of all arms and became a noted and feared duellist. He probably took even more delight in this pastime because he knew that Napoleon strongly disapproved and came down heavily on anyone caught duelling. Fournier by which he was known, the Sarlovese was added to his name very much later, was born at the little town of Sarlat in the Dordogne, one of six children of Jean Fournier and his wife Marie-Anne Borne. Francois was the eldest and entered the world at the small inn owned by his parents called "le Tapis Vert" on 6 September 1773. He was a clever, talented lad and possessed a fine singing voice for which he became noted in later life. He spent some years studying with the monks at Saint Gauden at the behest of the Bishop of Sarlat, Mgr de Pont de Albaret, who had recognised his classroom abilities. Tired of studying, he craved excitement and enlisted in the Garde Constitutionelle du Roi. However, serving in a Royalist regiment in these turbulent times was a risk, and although he didn't fear danger, he felt it an absolute waste to jeopardise his life for a cause he didn't even believe in. He enlisted instead, as a Sous Lieutenant in the 9e Regiment des Dragons under their commander General Anne-Pierre Montesquiou-Fezensac. Over the next 25 years or so he was to see a great deal of action including at Chatillon, Montbello, Marengo, Loria, Gaete, Eylau, Friedland, la Coruna, Fuentes d'Onoro, Smolensk, Gross Beeren, Leipzig, and others. While in Spain in May 1809, Fournier with just three infantry battalions, two squadrons of hussars and four guns, while Soult's II Corps, and Ney's IV Corps were operating in north eastern Spain, was charged with defending the small town of Lugo against any attack. Spanish General Nicolas Mahy approached the town on 18 May with an army said to number in excess of 15,000 men. Over the ensuing days, Mahy's army mounted a number of attacks and repeatedly invited Fournier to surrender. The French General steadfastly refused although outnumbered by 10 to 1, and four days later, Mahy's men abandoned their attempts having received word that Soult and his II Corps de l'Armee were returning. This was just one of the many acts of bravery displayed by Fournier right through his career. One of his greatest friends was the incomparable General LaSalle, and before that officer's marriage, the two got into many scrapes together in the pursuit of women and drinking exploits. 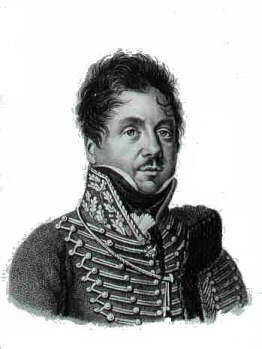 Although a brilliant commander, Fournier was often insubordinate and found himself in trouble on a number of occasions. He made a habit of being audaciously rude in the presence of the Emperor and found himself arrested and thrown into jail on more than one occasion. He developed into a fine figure of a man, about 5'10" tall with a well-built and powerful upper body, a slim waist and well formed muscular legs. His hair was jet black, short and wavy, his eyes bright blue. He also had a handsome, well-defined face and was never short of female company. It was a scandal with a local married woman in Sarlat that was another compelling reason for leaving his hometown when he did. At least one very senior soldier, le Marechal Michel Ney, disliked Fournier and regarded him as something of a bully, probably because of the way he went about provoking duels he knew he could not lose. Among Fournier's friends were a number of known anti-Bonapartist officers, including Generals Jean-Victor Moreau, Antoine Delmas, and the young 24 year old Gabriel Donnadieu who, like Fournier, also subsequently became a General. The young Sarlat born warrior had got himself into so many incidents incurring Napoleon's wrath that the Emperor sent him into exile. However, the losses of senior commanders on the battlefields up to and including Wagram had been high. Gone were d'Espagne, Lannes, LaSalle, Bonnet d'Honnieres, Auguste de Colbert-Chabanais, Lochet, Desaix, Cervoni, Campana, Brun, de Billy, Boudet, and one of the Corbineau brothers and at least five more were prisoners in England: Carrie de Boissy, d'Henin, Lefebvre-Desnouettes, Exelmanns, and Lejeune. Napoleon was compelled to bring Fournier back into the fold. He was a brave man and carried out many daring exploits, sometimes behind enemy lines. He was not showered with decorations and financial rewards as were many other senior officers, but he was made Baron and the Comte de l'Empire. In March 1819, the King wanted him to add Lugo to his name in recognition of his conduct in that town so many years before. Fournier however, preferred Sarlovese after a medieval hero of the Sarlat district. He never did marry although he had many opportunities. Young Aspasie Vedrenne of a family who were close to the Fourniers wanted to marry him when she was 16 but he considered her no more than a child. However, she did inherit most of his estate when he died in 1827 at the age of 53.